Healthcare providers are becoming more responsible for ensuring the efficiency and quality of the care they provide to Medicare beneficiaries. The shift toward value-based payment models means that measurements of efficiency and quality of care are increasingly used to determine financial bonuses and penalties. A recent report by a committee of the National Academies of Sciences, Engineering, and Medicine (NASEM, formerly the Institute of Medicine) --on which one of us served --finds benefits of adjustment of such measures for both clinical and social risk factors. Clinical risk factors are physiological attributes that can be associated with increased risk of certain diseases and health outcomes: they are already used to adjust quality and efficiency measures. Social risk factors are patient attributes such as low socioeconomic position, minority race or ethnic background, minority sexual orientation or gender identity, or living in a deprived setting. Research has shown that these social risk factors influence health-related outcomes: patients with these attributes have worse health outcomes, and providers that disproportionately serve them appear to, as well. 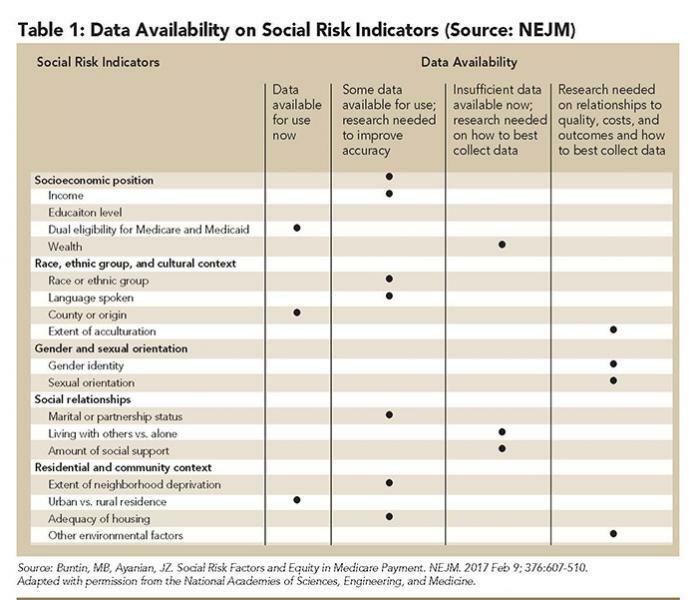 If they are not measured and adjusted for as clinical risk factors are, providers who serve disadvantaged populations could be unfairly penalized.1 In addition, providers might work to reduce the effects of social risk factors but doing so could require additional staff effort and costs. If social risk factors beyond providers' control are not accounted for, and providers serving disproportionate numbers of patients with high degrees of social risk are penalized, then disparities in health outcomes could widen. Stratified public reporting by social risk factors within reporting units to illuminate how providers serve those with risk factors. Adjusted performance measures to standardize estimates of quality. Direct adjustment of payments to providers who disproportionately serve those with social risk factors. Restructured payment incentives to reward improved quality or high-value care. The committee also found that development of new data sources and methods of measurement would be beneficial in identifying indicators of social risk. Table 1 shows the five major categories of measures considered important by the committee, and specific examples of measures in each category, which may be ready for use. One example is that data are ready for use on dual eligibility for Medicare and Medicaid (an indicator of low income), and the Medicare program could use them to adjust measures of - and penalties for - hospital readmissions. In addition, work to improve the accuracy of social risk data and use it for payment and quality measurement would likely benefit providers and patients in Nashville.1,2 Davidson County's poverty rate is higher than the U.S. average, and Nashville has a higher proportion of citizens who are members of minority races and ethnicities. 3 Accounting for social risk factors that a significant numbers of Nashvillians face would not only benefit the providers who serve these disadvantaged populations, but those directly affected by social risk factors themselves. 1 National Academies of Sciences, Engineering, and Medicine, Accounting for social risk factors in Medicare payment. Washington, DC: National Academies Press, 2017. 2 Buntin, MB, Ayanian, JZ. Social Risk Factors and Equity in Medicare Payment. NEJM. 2017 Feb 9; 376:607-510. 3 People Living Below Poverty Level by Race/Ethnicity, Nashville TN. HealthNashville.org (2015). Retrieved: March 9, 2017, from www.healthynashville.org Data Source: US Census Bureau, American Community Survey. 2011-2015. 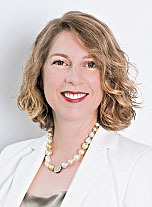 Melinda Buntin, PhD is a Professor of health economics and the Chair of the Department of Health Policy at Vanderbilt University's School of Medicine. More about her Department can be found at https://medschool.vanderbilt.edu/health-policy/ or by following @VUHealthPol. 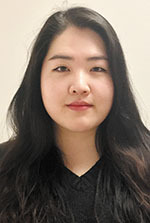 Aiden Lee is a senior at Vanderbilt University studying Medicine, Health, and Society with a concentration in Health Policies and Economies.